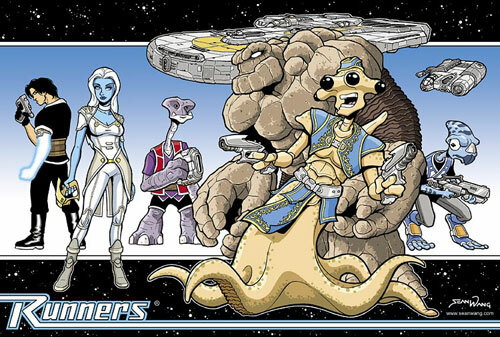 I stumbled across “Runners” in a recent Diamond Previews issue. Previews featured an ad for the trade paperback along with a recommendation. The art looked great, so I gave it a shot. This was one gamble that paid off. The illustrations in this book are top-notch! Sean Wang got his big break years ago drawing some of the Tick comic books. Obviously that training paid off here. Wang really has a grasp of body language and expressions. He’s also bursting with creativity. In regard to alien design, it seemed that Wang’s pencil was channeling George Lucas’ creative energy (on one of George’s good days). On top of that, he has a good grasp of pacing, panel design, background detail, and incredibly clean lines. After I read each issue in the trade paperback, I would flip back just to look over the art and make sure I didn’t miss any brilliant details. In addition to great art, it’s a solid space romp about smugglers doing their best to complete a job. The main characters run into roadblocks along the way that make for an interesting story. The banter is great; each character has a distinct personality; and you really get caught up in the cinematographic feeling of each action scene. This first trade paperback is called, “Runners: Bad Goods” and is available from Sean Wang’s website, or your local comic book shop can probably order it for you. The next mini-series still awaiting publication is called, “Runners: The Big Snow Job“. It’s scheduled to be published by Archaia Studios Press, but they’ve suffered some delays recently. If you want to see some preview pages of the fantastic artwork, there are several on Sean Wang’s website. I can’t recommend this series enough. Give it a try! If you don’t want to commit the money, contact me. Maybe I’ll loan you my copy! Do you realize how many times you said Wang? Yes, yes I do. Now go buy the comic! I happened to randomly come across this review and it made my day! Thanks for the kind words on my RUNNERS series. It’s always encouraging to hear from people who are enjoying the BAD GOODS graphic novel. Hopefully the second series (THE BIG SNOW JOB) will be out in the near future. I’m very psyched about that one since the story gets a bit more into the mob world of the RUNNERS universe. Woo hoo! Sean – Wow! Thanks for stopping by! I’m anxiously awaiting THE BIG SNOW JOB. I will also spread the gospel of RUNNERS in the meantime.